All dogs lick, but some dogs lick in excess. There is often a behavioral or medical reason for the licking. Behavioral reasons for why a dog licks are far more common than medical reasons. It is not usually the sign of a serious health condition. This behavior might include the dog licking or grooming themselves, furniture or other surfaces, and even you! 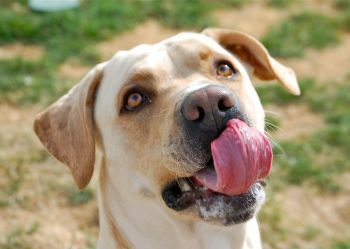 Dogs may lick because they like the salty taste of their owner’s skin, as a sign of affection, or out of habit and boredom. Licking can also be calming or soothing, much like when people receive a relaxing massage. A pet is a member of the family and as pet parents we take their health seriously! So, we built this calculator to help you estimate their health cost, based on data compared to other breeds. Excessive licking or licking more than usual could be the sign of an underlying medical issue. Signs of excessive licking will often resemble those caused by behavioral licking (hair loss, irritation, etc.). Potential medical causes for licking include allergies that cause the skin or paws to itch. Infections from bacteria, fungus or parasites can also cause itchiness and therefore lead to excessive licking. Underlying pain from an injury or arthritis can cause dogs to lick, similar to when a person rubs a sore muscle or joint. The licking releases endorphins, which are the body’s natural pain killers, to help soothe the pain. A final cause of licking can be from gastrointestinal issues. To relieve the issue a dog might lick strange surfaces, but not usually itself. If a cause is thought to be medical, a consultation with your veterinarian is required to diagnose and treat your dog’s condition.